While touring in Paris we viewed several important public building and palaces. Such places included the Garnier Opera House which was built in 1875. It was use as the setting for Gaston Leroux's 1910 novel “The Phantom of the Opera” and Andrew Lloyd Webber's popular 1986 musical. We also passed by the Assemblee Nationale (where the lower house of the French Parliament meets), although we did not enter the building. 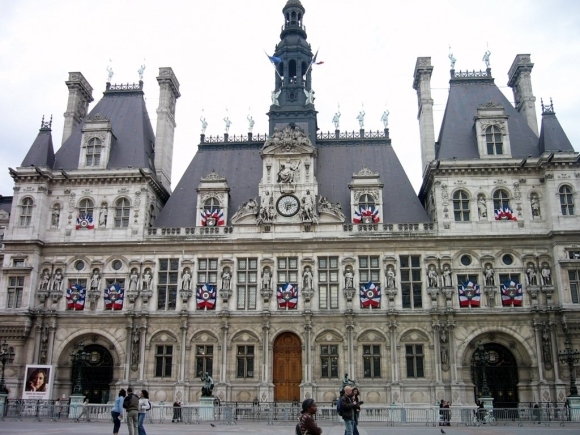 The Hotel de Ville houses the local Paris city administration, the Mayor of Paris, and also serves as a venue for large receptions. On the outside of the building are 338 individual figures of famous Parisians on each facade, along with lions and other sculptural features. The Grand Palais is a large historic site, exhibition hall and museum complex located at the Champs-Élysées. Construction of the Grand Palais began in 1897 as part of the preparation for the Universal Exposition of 1900. Esplanade des Invalides is a complex of buildings containing museums and monuments, all relating to the military history of France, as well as a hospital and a retirement home for war veterans (the building's original purpose). The buildings also house the burial site for some of France's war heroes, notably Napoleon Bonaparte.